Anastassia Abramenko started her training at a ballroom dance academy in Kaliningrad, Russia in 1990. Between 1992 through 1999 she won many prizes during international ballroom championships in the following countries: Russia, Denmark, Germany, Poland, France, Czech Republic, Italy. In 1999 Anastassia had an opportunity to enter one of the prestigious competitions in the United States, called 'United States Dance Championships', or USDC open to competitors from around the world. After seeing all the enthusiasm associated with ballroom dancing in the U.S. Anastassia and her family decided to move to the United States. Anastassia moved to Jacksonville FL, where she began her instructing career first with Fred Astaire Dance Studios and later at studios throughout the First Coast and other states of the United States. From 1999-2001 Anastassia won several competitions in Florida. Everyone she has met throughout her journey has been instantly drawn to her passion for dancing and teaching along with her quality of dancing. 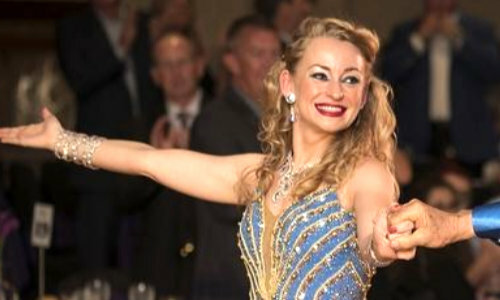 Currently Anastassia is teaching and competing in International Latin and Ballroom styles, along with American Rhythm and Smooth styles. Now, she competes nationally throughout the United States with her students in the Professional-Amateur (PRO- AM) division, a division in which she has earned multiple awards and titles. In the past 13 years a number of her students took home the 'Top Student' title in the Open and Closed Newcomer, Bronze, Silver and Gold Pro/Am, Rhythm, Smooth, Latin and Ballroom divisions at the numerous DanceSport competitions. At last year's DanceSport championship, Anastassia received a 5th place Top Teacher award, and 4th place overall for the year of 2013. In 2013 Anastassia was in the 7th place of the Top Female Teacher category in the nation. As of 2014 she was currently in the 33rd place of the Top Female Teacher category and ranked top 29 as of February 2017 per the World Pro Am Dancesport Series. In addition to ballroom dancing, Anastassia has performed at the Jacksonville Florida Theatre in The Community Nutcracker Ballet. She has also performed with the Atlanta Symphony Orchestra in Cirque De La Symphony.